First, the lens seems well-built. The helicoid is pretty smooth, though it goes from infinity to 1:2 in maybe 15-deg of helicoid rotation. It might be difficult to get critical focus at f/2.8 for medium subject distances. The full range of infinity to 2:1 happens in only around 180-deg (!!) so this lens focuses very fast indeed. Manually, of course. Aperture is fully manual. This is great for studio situations with continuous lighting, which is my preference, so I am happy. Some folks might prefer automatic mode, but oh well. The thing that I found most interesting is the lens is "internal focusing" It does not extend at all when focused. The front lens group sits deep inside the body of the lens at infinity, and moves to the front at 2:1, so it has a built-in lens hood for lower magnifications and best working distance at max mag. Seems a very good design. The result of this is the lens is very compact and easy to use. The working distance at 2:1 is a bit over 2", which is enough for good lighting flexibility. I had no issues with lighting using this lens. 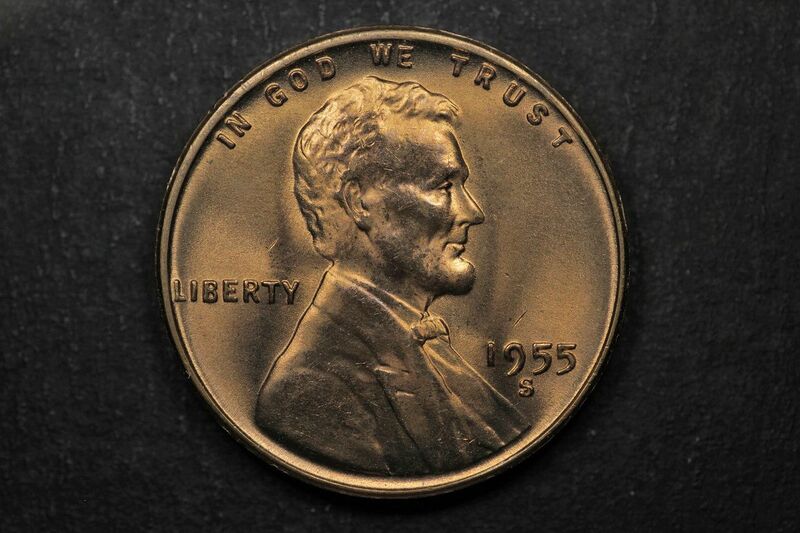 The subject is a 1955-S Lincoln Cent RPM #4 in BU condition. I shot in Aperture Priority mode, with -1EV to avoid any hotspotting. I did an aperture sweep at f/2.8, f/4, f/5.6, and f/8 at M=0.7 and cropped near the center. I like to use Lincoln's beard as the subject for comparisons. 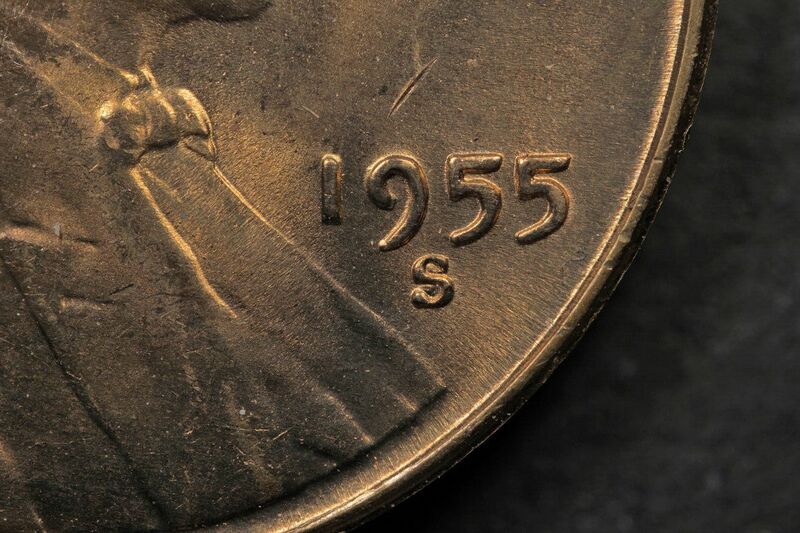 The f/5.6 looks sharpest to me, so this would be around f/9.5 effective. There is significant distortion of image in the corner, more than I've seen on any other lens I've tested. This will keep the lens from being useful for stitching. f/4 is sharper in the center and significantly sharper in the corner versus f/2.8. This LongCA is mostly removed by stacking, but single images will suffer from color shifts on out of focus areas. 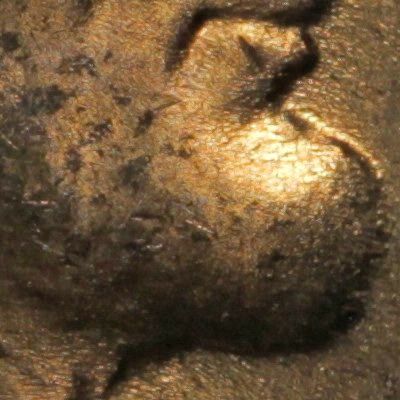 This can be particularly noticeable and annoying on silver coins. Copper is not as big a deal. I bought the lens in Nikon mount for more flexibility, though all my first tests are using the Canon HRT2i with Nikon-EOS adapter. Great idea! Since the lens is full manual, there's nothing lost in doing it this way, and quite a lot of flexibility is gained. The helicoid is pretty smooth, though it goes from infinity to 1:2 in maybe 15-deg of helicoid rotation. It might be difficult to get critical focus at f/2.8 for medium subject distances. It's probably best to think of that ring as controlling magnification, not focus. Dial in the magnification you want, then focus by changing the camera-to-lens distance. I don't follow this. Any of the high end stitching programs can handle essentially unlimited amounts of barrel and pincushion distortion, even higher order stuff like gull wing distortion. What's the nature of the distortion with this lens that makes it so difficult? Ah, wait, maybe I see. Comparing the two "s" shapes -- which have significant depth -- it's apparent that the one in the corner is being viewed from a different angle than the one in the center. That would be a matter of entrance pupil location, which I gather must be farther forward than what you've seen with other lenses. Is that the issue? But keep in mind this lens focuses to infinity. Moving the camera-lens distance is not practical at lower magnification. For studio macro as I'm doing here, no worries. But I intend to take this lens into the field and use it as a standard macro lens, and in this mode I'll need to use the helicoid for focusing. I am not sure what type of distortion I'm seeing from this lens. I don't think it's a perspective issue, as this lens seems to be nearly telecentric. You can see this from the nearly perfect alignment of the stack images in the corner as indicated by the red stuck pixel of my HRT2i being rendered as a single point in the stack. I have only seen this stacking behavior from a few other lenses, most notably the Nikon MM3x and MM5x objectives. All others tend to show a locus of red dots due to image scaling through the stack. 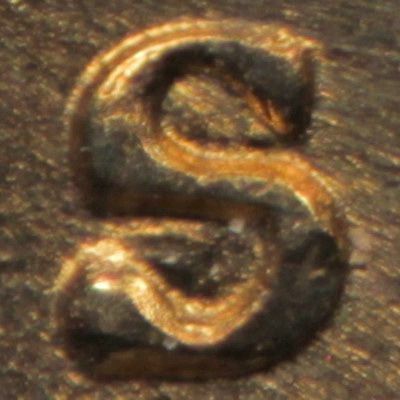 Comparing the S's I see a fairly large scaling problem at the corners. 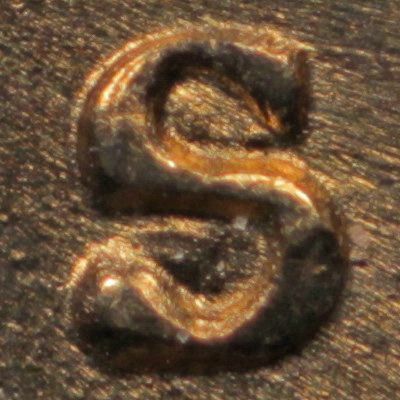 The S in the corner is quite a bit larger than same S in the center. What type of distortion is this? If the stitching programs can handle this level of distortion, then I think pretty much any lens can be used for stitching! If the stitching programs can handle this level of distortion, then I think pretty much any lens can be used for stitching! That's true -- pretty much any lens can be used for stitching as long as you don't have to deal with parallax issues caused by entrance pupil shape or movement. What the stitching programs do is to include a very general model of lens distortion that includes a standard analytic form like rectilinear or fisheye, combined with a potentially high order correction polynomial. With careful calibration, these models can usually back out any lens distortion to subpixel accuracy. What type of distortion is this? Beats me. I would have to know more about the subject, and I still probably couldn't figure it out unless I had the lens in hand to play with. Look at the lower left lobe of the "s" and notice how the front surface of the letter appears to move sideways with respect to the background as the image toggles between the two views. That's because you're looking at a 3D subject from two different angles. Got it. I had not realized that "medium subject distances" meant "too far to tweak focus by adjusting camera position". as this lens seems to be nearly telecentric. Well, it's certainly not telecentric at low magnification. If it were, you'd be imaging a circle no larger than the front lens element even at infinity focus -- pretty bad vignetting! Maybe it becomes telecentric at higher magnification, and if so that would be very interesting. An easy way to tell is stop down the lens, look into the front, and see where the aperture appears to be. Unless the aperture appears to be far in the distance, then the lens is not nearly telecentric and something else is happening to keep that red pixel in one place. How did you adjust focus when shooting the stack? The program did indeed compensate for the majority of the distortion. Impressive. Some of that apparent perspective movement may just be due to lighting. I did not move the lighting when I moved the coin from center to corner of the frame, and the lighting is fairly directional. I have a vertical rig. I moved the coin vertically for the stack, with the camera fixed. What is a good physical test I can do for telecentricity? Perhaps using a small cylinder or some other suitable subject? I'd like to add some kind of test to my usual regime but it's not clear to me how to do it properly. Yes, the difference in lighting is definitely a confounding issue. To get around that, the trick is to focus attention on small features whose location is not affected by the lighting, even though their appearance might be. Here's what I mean. Look at how the little square blob sitting on top of the "s" pops back and forth across the thin line that I've drawn between small dots on the planar surround. What is a good physical test I can do for telecentricity? The best test I know uses a planar subject with fine detail, something like those laser-printed dots that I use for testing objectives. Line up the subject and shoot it two times, slightly on either side of focus. That way the subject will have almost identical appearance except that the scale may change because of the altered distance from subject to lens. Then pull those two images into Zerene Stacker, tell it to align them allowing Shift and Scale, and look at the console log or saved project to see what RegistrationParameters scale value Zerene computed for the second image. 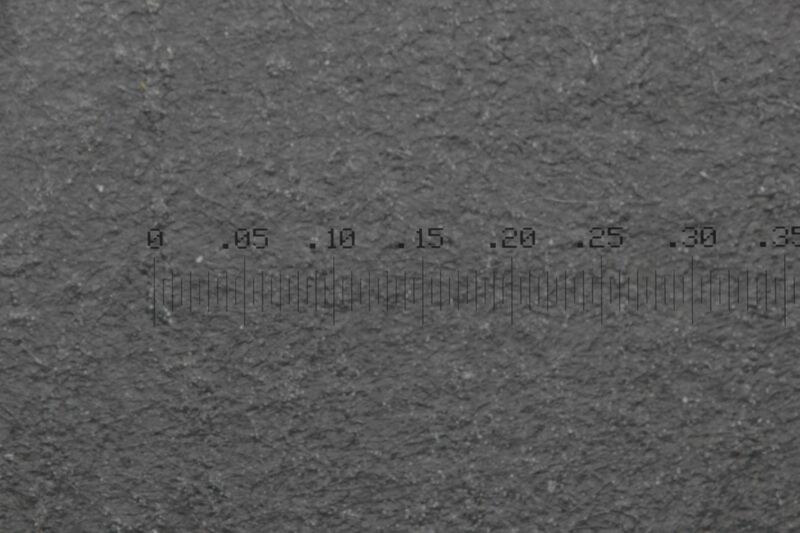 The scale value will be a number slightly different from 1.0, reflecting the ratio of magnifications between the two images. In other words, it's how much the scale changed, divided by how much you changed the distance to subject. That corresponds directly to how much those central rays converge, diverge, or stay parallel as they go from subject to lens. For a perfectly telecentric lens, the number will be 0.0, exactly zero change in scale with distance, central rays perfectly parallel. 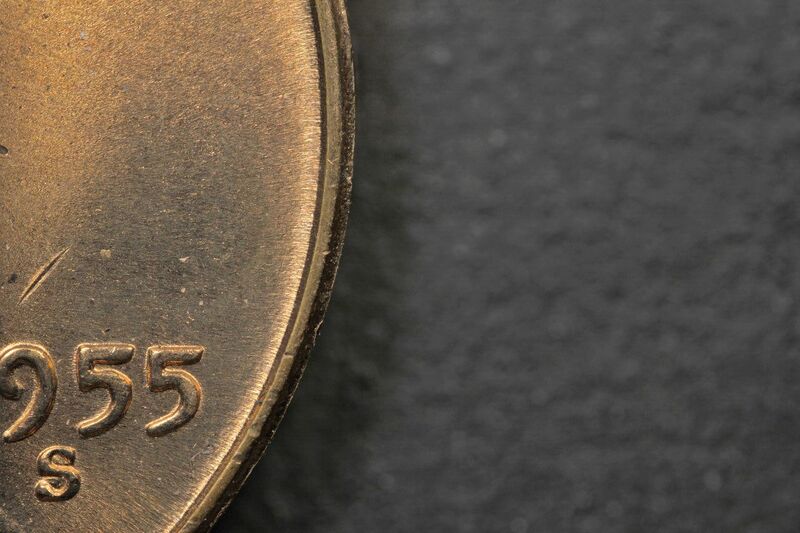 For a lens that can be treated as telecentric for purposes of stacking, the number should be a fraction of a pixel between the front and back of in-focus regions. For example if the frame is 5000 pixels wide, it's OK for the scale to change from 1.0 to 1.0001 (one part in 10,000), but it's not OK for the scale to change from 1.0 to 1.001 (one part in 1000). The measurement can be made more sensitive and less noisy by stopping down the lens and using a correspondingly larger difference of distances. Hmm...perhaps. It still just looks to me like that piece of dust is moving due to scaling, or due to lighting, but you may be correct. Sounds good. What about a microscope calibration reticle? I like the idea of testing stopped way down to get sharper OOF High and Low images. Thanks for the suggestion, I will give it a try. I used to use CZP, and it told the scaling and xy offsets for each stack iteration. When doing stacks with the Nikon MM objectives, the scaling was always 1.000 to whatever decimal places that program reads out. I used a microscope calibration slide for the telecentricity test, and did a direct pixel measurement to see the magnification changes. Focusing was 75um below critical focus to 75um above. This was the approximate range used for the earlier stacks. 8.89mm/4085=2.176um, so at 2:1 this would imply pixel pitch of 4.353um, about right for my 18MP HRT2i. So front to back over a 150um range the scale shift is resulting in 14 pixels of scaling. This indicates the lens is NOT telecentric at 2:1. In the animated blob and line picture, when the blob moves south west, the "flat" surface of the coin moves north east. I think that's telling us the same story. Yes, I see it now. Makes perfect sense. I'm glad to hear that "the penny dropped" about the blob and surface. Yes, the relative movement of blob and surface is also telling us that the lens is not telecentric. If the lens were telecentric, then the blob and surface would remain fixed with respect to each other no matter how the coin was slid around, or equivalently, how the camera+lens was slid around. ...over a 150um range the scale shift is resulting in 14 pixels of scaling. 4085 pixels at critical focus * (0.150 mm / 14 pixels) ~= 44 mm from subject to entrance pupil. I haven't checked this method, though, so please don't rely on it. Anyway, at the same 75um above critical focus vs 75um below critical focus, the FOV had no change...3905 pixels at both extremes. So the Nikon MM5x (and likely the others in the series) are indeed telecentric. So the Nikon MM5x (and likely the others in the series) are indeed telecentric. As we would hope. After all, the "MM" stands for "Measuring Microscopes". It would be a bad thing if a slight error in focus turned into a slight error in measurement! Today I found this review: https://www.wimarys.com/venus-60mm-macro-lens-review/. If one checks the test charts, one can see noticeable chromatic aberration in the corners of the frame even at F/11 (tested on full-frame camera). The center looks much better. So my question to you, Ray - how much chromatic aberration do you see in practical use? I don't see much lateral CA in my images, though I am not particularly sensitive to it. The longitudinal CA that I showed was fairly severe, but didn't seen to be as bad in the middle of the frame. So for my purposes, I don't have an issue with the lens.